Howdy! Welcome to the latest round of fun. Let's see what I can rustle up to share with everyone this week. This is a blast from the past and a total blast to boot! Star Trek as the A-Team. From ZD Net - Japanese Vending Machines: Now Dispensing Wi-Fi. 50 meters around the vending machine. Sweet! Drink and surf! Heh. 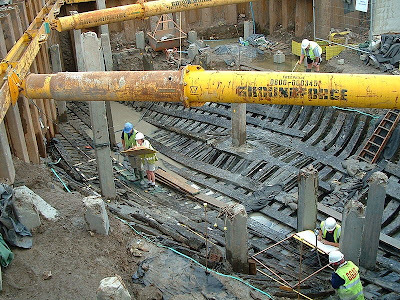 Secrets of Life on Newport's Medieval Ship Revealed by Nicola Smith at BBC News. 10th Anniversary of the find. Poster for Zac Efron and Nicole Kidman's "The Paperboy" - looks promising. Very retro. Ukranian Lighting Engineer Stuns the Audience. This is way way cool. Had seen something similar before but not to this scale. Starts about a minute in, so wait for it. You won't be sorry! This is a longer version than the one you see on TV. This is so darn cute I had to share it when I saw someone post it again. Heh heh. The Force: Volkswagon Commercial. This is beyond wicked awesome! From the Tel-Aviv Quantum Levitation peeps at www.quantumlevitation.com This will blow your mind! Worldly Wednesday: Muslim Terrorists? from Ellie Ann. Great post about seeing the whole truth. Nice! Bayard and Holmes Post Apocalyptic Management Services. Heh heh, heh heh. Heh heh heh heh. How to Build Your Reputation as a Writer by Paul Rance. Nice, quick little post with some definite wisdom thrown in. Your Author Blog or Website - what an editor might look for. Great post by Theresa at EditorTorrent. From Chuck (NSFW) Wendig - 25 Things Writers Should Stop Doing. On the same vein I give you a post from DIY MFA - Making the Most of Failure. More awesome wisdom for the new year! From EditorTorrent - Switching Senses. Great tips! Okay, my eyes are being mean to me today so this is it. Enjoy!